Five fingers for Marseilles is a slow-boiling thriller building to an explosive finish and deals with questions about the corruption and lingering remains from the apartheid regime within today’s South Africa administration. The movie takes the form of a traditional western. The Film starts with the “Five Fingers” childhood friends rebelling against the white oppressors who routinely exploit and brutalize the local population. The situation escalates and young Tau shoots two policemen and decides to self-exile himself, living his comrades deal with the after effect of the crime. Twenty years later young Tau comebacks to Marseilles after leading an outlaw life, he is now known as “The Lion of Marseilles”. After being released from prison, he comes back to Marseilles and aims to live a peaceful life. However, Although the apartheid regime has fallen, it seems that newly empowered black locals — including some of his childhood friends— are as brutal and corrupted as the former occupiers. Young Tau, the knight-errant, the young Lion has to renounce his peaceful life and face his new enemies in order to protect his family. Charles Trapunski, FIVE FINGERS FOR MARSEILLES: TIFF17 REVIEW, Brief take. 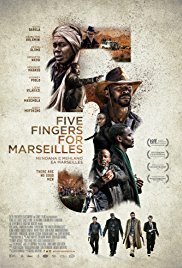 Louis Rossier, FIFF2018] FIVE FINGERS FOR MARSEILLES : LE WESTERN BÂTARD D’AFRIQUE DU SUD, Daily Movies. Alan Harris, Five Fingers for Marseilles, Glued To The Seat. Kambole Campbell, FIVE FINGERS FOR MARSEILLES – LFF 2017 REVIEW, One Room With A View. Shelagh Rowan-Legg, FIVE FINGERS FOR MARSEILLES – LFF 2017 REVIEW, ScreenAnarchy.com. Matt Marshall, TIFF 2017 REVIEW: ‘FIVE FINGERS FOR MARSEILLES’, RIDES INTO BOLD NEW TERRITORY, We Live Entertainment.